Available for $595 + $120 per year, Download Rates provides a practical way to download currency exchange rates from internet services and store these rates in Sage 300 databases. The program is designed to run as an unattended Windows Scheduled Task or from a user interface. "Now I'm installing Download Rates ... to retrieve 15 currencies daily, for 200 companies; Imagine the time saving" François Tremblay, ACCEO Solutions. Show complete quote. The downloaded interbank rates can be adjusted by a specified percentage so as to more accurately represent future settlement rates. 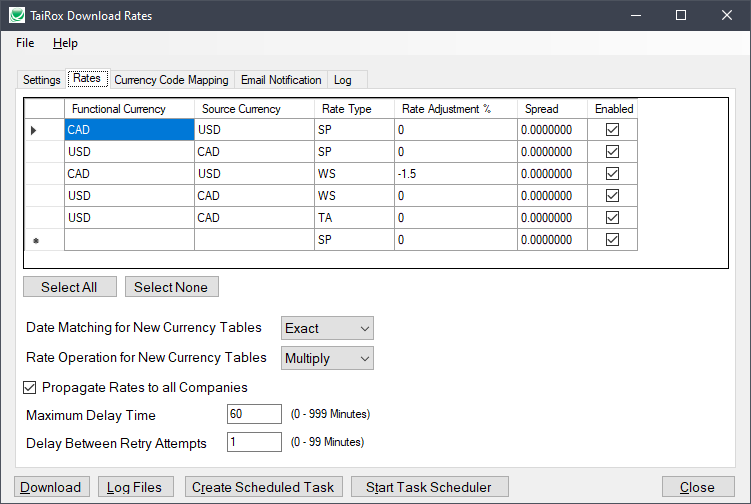 A mapping table will translate from ISO to Sage 300 Currency Codes. Download Rates provides a practical way to support Sage 300 "spreads". Supported services: US Federal Reserve, Bank of Canada, Reserve Bank of Australia and currencylayer. Users of currencylayer must subscribe to their service. Google is no longer providing a free service as of July 2015. Yahoo is no longer providing a free service as of November 2017. Bank of Canada has changed their RSS feed URL and reduced the number of supported currencies as of April 2017. Disclaimer: Rate providers qualify their offerings by indicating that the rates are provided for analytical purposes only. TaiRox does not gaurantee the accuracy of rates provided or that any supported provider will continue to offer their service. • Updates multiple exchange rates for multiple days in multiple companies in a single operation. • Uses Sage 300 Rate Types so that multiple rates for the same two currencies can be maintained. • Will convert from ISO Currency Codes used by Providers into "non-standard" Sage 300 Currency Codes. • Provider rates can be adjusted by a percentage to more accurately reflect a rate actually used in transactions. • One-time entry of a Sage 300 "spread" makes this warning function more practical.